Our Bihr Box container solutions are recycling stations intended for waste collection. Certified NF EN 13071-1, NF EN 13071-2 and NF EN 13071-3, they are used to collect household refuse and organise selective sorting in areas with dense populations or requiring the least possible footprint. Container capacity from 3000 to 5000 L.
The underground container inlets are modular: they can collect glass, newspapers, packaging and household refuse. The inlet colours can be customised just like the colours on the bodies to show differences between containers better and match all types of environment. The openings can be locked and hatches are designed to prevent jamming. A large producer hatch is available on all models. Lastly, all models are prepared for access control and their maintenance is made easier. 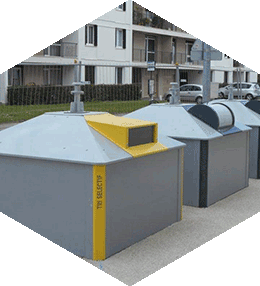 BIHR underground containers are suitable for both urban and suburban areas and areas with moderate to high population density. Our underground containers are found in many town centres and large collective housing estates. Bihr designs and manufactures a range of hygiene equipment for public, residential and service sector spaces. These urban planning solutions have been adopted by many players: municipalities, towns, developers, promoters, social lending institutions and institutional establishments.